BOSTON - Despite senior Evan Rodrigues' second hat trick of the season, the No. 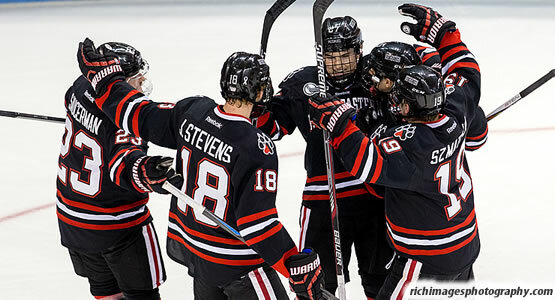 4 Boston University men's ice hockey team came up short in its attempt to clinch the Hockey East regular-season title outright, as its late rally was not enough in a 6-5 loss to Northeastern on Friday evening at Agganis Arena. BU moves to 20-7-5 on the year with a 13-5-3 Hockey East mark. The Terriers will enter the final night of the regular season two points ahead of second-place Boston College, which earned a 2-0 win at Notre Dame. It was a game of runs, as the Huskies scored three goals in under two minutes to jump out to a 3-0 lead late in the opening period. The Terriers got back some momentum, however, scoring twice before the first-period horn sounded to make it a one-goal game. The Huskies stormed right back and put together another three-goal run to build a 6-2 cushion with 7:56 left in the middle stanza. The Terriers had another rally in them, however, as Rodrigues got his second of the night in the final minute of the second and junior Ahti Oksanen added his team-leading 20th goal in the opening minute of the third on a power play to create a 6-4 score. BU had two more chances with the man advantage in the third with Rodrigues scoring on the latter to seal the hat trick with 5:43 remaining. The 6-5 deficit would be as close as the home team would get, as the Huskies held on to earn a big road win and improve to 16-13-4 overall and 11-8-2 in conference play. John Stevens earned three assists for the Huskies, who got goals from six different players. Dalen Hedges, Kevin Roy and Nolan Stevens each recorded a goal and an assist for the visitors. Zach Aston-Reese, Dylan Sikura and Mike Szmatula all found the back of the net as well. Nick Roberto got BU on the board with his fourth tally of his sophomore campaign while juniors Danny O'Regan (3) and Matt Grzelcyk (2) and freshman Jack Eichel (2) each had multi-assist performances. Northeastern held a 40-29 shot advantage and both squads went 3-for-4 on the power play. Junior Matt O'Connor stopped 25 of the 30 shots he faced in goal before being replaced midway through the game by freshman Connor LaCouvee, who made nine saves and allowed the eventual game-winner. Clay Witt picked up the win for the Huskies with a 24-save performance. The two teams will meet for the third time in six days on Saturday (Feb. 28) at Matthews Arena beginning at 8 p.m. The game will be broadcast by NESN, but will start on NESNplus and move to the primary station following Bruins' coverage.